This table will show you each character display picture, health value, special move, and weakness if it is known. The names shown are from the only known english translation of the game. It is possible they may be made up by the translator himself. If you are playing single player, you will only be able to play the top three characters. Characters with the healing special move typically have the most longevity in battle, especially with a full meter of specials. The best overall character is definitely Tapa, since she has the healing special move and also has the most health out of the ones who use a that type of move. You may also choose to be Zor, the boss from single player, which is obtained by pressing the following at the character selection screen: hold L and R, and hit Down, Up, Down, Down, Up, Up, Left, Right, A. He has more health than any of the characters (slightly more than the Goliath), and also removes all the gray blocks as his special move; however, using him is probably considered cheating. Dagger Block - Attacks your opponent with a dagger. Scroll Block - Attacks your opponent with a magic fireball. Potion Block - Heals some of your health. Egg Block - Attacks your opponent with a hatched dragon. Purple (Blank) Block - Does nothing. Heart Block - Raises your maximum health, and heals you completely. The heart blocks are fairly rare, and even more rare to get them lined up. Example of two sets of three (six). Example of one set of three, and one of four (seven). Lining up five blocks together, vertically or horizontally will get you a special move. Getting five in a row may sound like a challenge, but if you do it early in the game, it becomes very simple. For more information on this, view the Starting Out section. You get the exact same selection of blocks as your opponent for the whole game, although they will begin to look different, as both of you are going at different speeds. You will lose if you fill your screen above the top line with blocks, however you can still get a line while the blocks coming down are out of the screen, as long as you get a line from that move. You will also lose if your health drops to zero; however, there is a graphical glitch that will show your health as fully red even though you still have a very minimal amount. Grayed out blocks appear in your field when other players get chains. These grayed blocks can sometimes appear in your blank playing space, causing gaps in your blocks, and making you lose space. 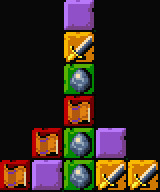 Most effectively, sometimes gray blocks can appear under you while you are dropping blocks, which causes the blocks to stack on top. Because of this feature grey blocks never spawn too close to the top of your play field (they never go in the top three horizontal spaces). Example of one chain (two egg blocks drop down, lining up). Always try to get diagonals, because even not by choice, you have a greater chance of getting chains, since you are usually making a couple lines drop. Statistically this is the best move of chance.